Nestled deep in the Connecticut River Valley are Amherst and Hadley, two New England towns responsible for the inspiration of many classic poets, writers, and thinkers of America. In Amherst and Hadley: Through the Seasons, the landscape changes continuously throughout the seasons. Each season brings its own natural beauty and dangers, from the scorching summers to the bitter winters. This photographic history offers a rare glimpse of Robert Frost's world of fire and ice. Visit a place where Ralph Waldo Emerson ate dinners with Emily Dickinson's family and see the site on which Noah Webster founded Amherst College. Look through a visual record of small towns, where the seasonal changes of the hills, fields, and woods inspired local writer Ray Stannard Baker and area photographer Clifton Johnson. Meander through a place that left fond memories in the hearts and minds of former Supreme Court Chief Justice Harlan Fiske Stone and writer Sylvia Plath. 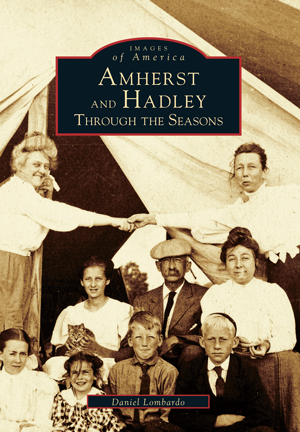 Daniel Lombardo, curator of special collections at the Jones Library in Amherst, has created a journey through the seasons in the towns of Amherst and Hadley that will fascinate and delight young and old alike. Lombardo has written a number of other books, including Amherst and Hadley, Massachusetts in the Images of America series, and his work makes an important contribution to the recorded history of the area.